Having said that, one question that may linger is what a to-do list really is. 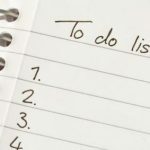 It is a list that contains all the tasks a manager expects to accomplish and when he expects to achieve them in a given time period. Undoubtedly, a professional list of activities should not stop there; it should consist of a few reasonable approaches through which the tasks are expected to be accomplished. In my opinion, that is when I can say a manager’s professionalism is worthy of notice. For most, it is the dominant players – Facebook and Twitter – which are utilised to help grow and promote their businesses. However, there are several other platforms, lurking in the shadows which despite being overlooked are jam packed with features specifically designed to help you and your business excel. If you’re in business, LinkedIn might just be the way forward.